Steel beam rendering courtesy of Clark Construction. The last steel beam of the Aquarium of the Pacific’s new Pacific Visions wing was set in place today during the topping-off ceremony of what will be a 29,000-square-foot, two-story sustainable structure and the first major expansion for the local nonprofit. Clark Construction crews raised the beam onto the 361-ton steel skeleton, which carried with it an evergreen tree, signifying the everlasting nature of the building, a broom mounted with the bristles turned upward, signifying a clean sweep or that no safety incidents have occurred since construction started and the American flag, “honoring those that came before us to build this great country and all that will come after us,” said a Clark Construction representative. Beforehand, a resident Magellanic penguin, Mayor Robert Garcia and others involved with the $53-million project signed the beam to commemorate what has been a long time coming. With an updated completion date projected for spring 2019, Pacific Visions will house a state-of-the-art immersive theater, expanded special exhibition and art galleries, as well as additional space for live animal exhibits. 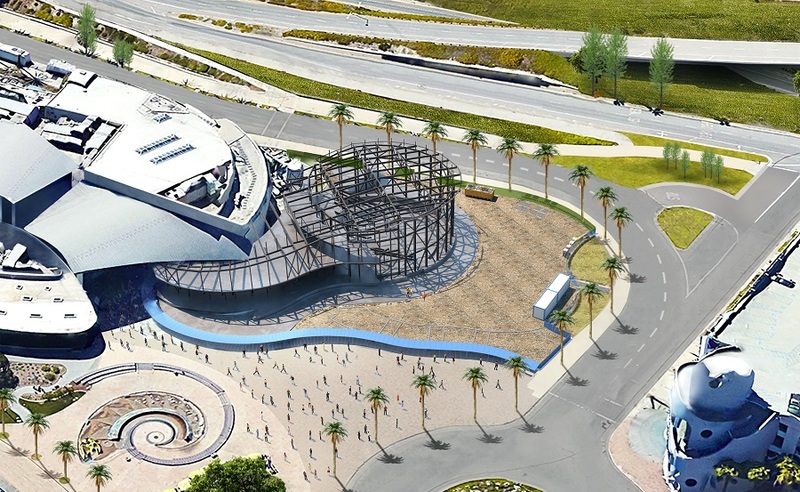 The Pacific Visions wing will help the aquarium better continue its effort to involve the public in designing a sustainable world for the future, and is the second and final phase of a Campus Master Plan adopted in 2005, according to the aquarium. “Pacific Visions will provide an aquarium experience unlike any other and will help our visitors gain a deeper understanding of their relationship with our planet,” Dr. Jerry Schubel, aquarium president and CEO, said in a statement. The new wing, which was supported by the City of Long Beach with a $15 million matching grant, a $5 million matching grant from John, Michelle, Mario and Therese Molina and $5 million from American Honda Motor Co., will increase the institution’s audience capacity to about two million visitors annually. To date, $47.4 million has been secured for the expansion from a multitude of donors. Clark Construction Western Region Senior Vice President Marc Kersey and Senior Project Manager Tom Farrar offered updates on the construction of the sustainable structure, which was designed by the San-Francisco-based architecture and design firm EHDD. A sample of the expansion’s ocean-like exterior was also shown to media. Learn more about Pacific Visions here.